Check out stream scores. Scores are tallied based on the benthic macroinvertebrates that our Adopt-A-Stream Teams find during spring and fall sampling. 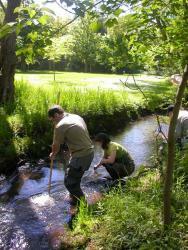 The quantity and type of aquatic insects that our Stream Teams find give us an overall indication of a stream's health. You can also check out the location of adopted streams. Help us add more dots to the map by joining the hands-on Adopt-A-Stream fun today! This page last updated on 3/15/2011.